We have a couple ranks you can earn, and they also come with benefits! 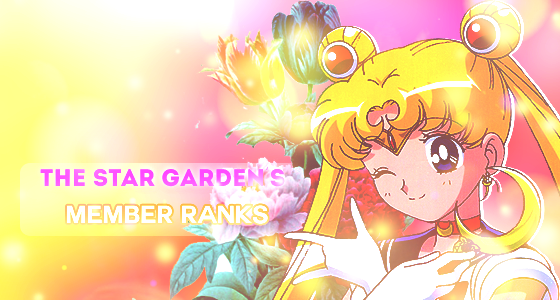 These ranks are based of off Sailor Moon's transformations in the manga. We added these to make the forum experience more enjoyable! The very first rank you get here! Comes with no extra info. Pm a staff member with the title "I want to become a crystal member". Be a member for 2 weeks. Have at least 60 posts. Pm a staff member with a PM titled, "I want to become a cosmic member". And your request will be accepted if you meet the requirements. PM a staff member with the title "I would like to become a crisis member" and we will ask you questions relating to the site rules, conduct, and maybe some sailor moon stuff! However you are free to decline being asked. Must be registered for 4 months. Pm a staff member titled "I want to become a eternal member". You choose a sailor moon subject (sera myu, anime, manga, etc), and you have to complete a 10-question quiz. To pass, you have to at least get an 70%. If you fail this quiz, you have to wait 5 days to retry.